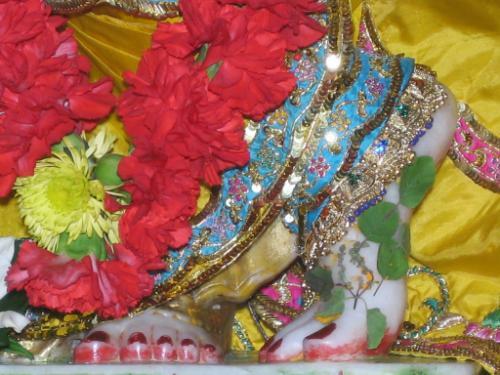 "A pure devotee always engages in the service of the Lord, taking shelter of His lotus feet, and therefore he has a direct connection with the saffron mercy-particles that are strewn over the lotus feet of the Lord. Although when a pure devotee speaks the articulation of his voice may resemble the sound of this material sky, the voice is spiritually very powerful because it touches the particles of saffron dust on the lotus feet of the Lord. As soon as a sleeping living entity hears the powerful voice emanating from the mouth of a pure devotee, he immediately remembers his eternal relationship with the Lord, although up until that moment he had forgotten everything."